In one large bowl, mix wet ingredients – yogurt, milk, egg and butter. In another large bowl, mix dry ingredients – flours, baking powder, salt and sugar. Combine the two sets of ingredients into one bowl and stir well. This batter is lumpy so don’t try to beat out the lumps. Add a little butter or non-stick spray. Pour ¼ cup batter into the skillet and top with almonds. 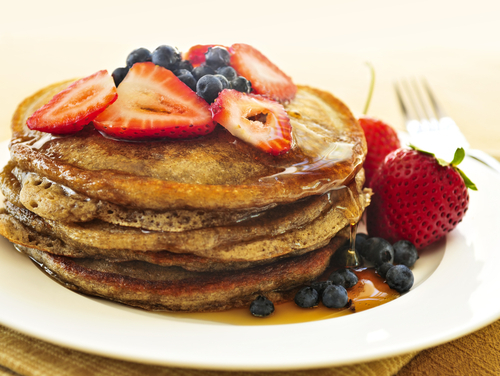 When bubbles pop up on the surface of the buckwheat pancake, flip. Cook until the bottom is slightly brown, almonds will roast. Repeat until all buckwheat pancakes are cooked.